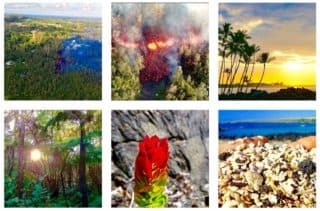 “After Dark in the Park” is a free lecture series held every Tuesday at 7:00 p.m. at the Kilauea Visitor Center auditorium in the Hawaii Volcanoes National Park. You can see the schedule for the upcoming talks here. The topic of each lecture is connected in one way or the other to the park. Topics include of course the current and historical eruptions of the Big Island volcanoes, but also Hawaiian culture and history, native and endemic flora and fauna, and much more. Lecturers include geologists that tell about the current and historical eruptions, artists, filmmakers, storytellers, and musicians. To get an impression of the possible topics you can have a look at the video archive of the 2018 after dark in the park lectures. If you happen to stay overnight in Volcano Village in one of its many cozy vacation rentals, you really should try to attend one of these talks. They are perfect to combine with a nightly visit to the Halema’uma’u crater, and you are guaranteed to learn something unique about Hawaii.